1. Mix the tequila with the grapefruit juice, sugar syrup and lime juice. 2. Pour the mixture equally into 8 tall glasses filled with ice. 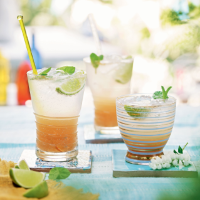 Top up with soda water and add the lime wedges and mint to serve. For an alcohol-free version, omit the tequila and adjust the amount of sugar syrup to taste.